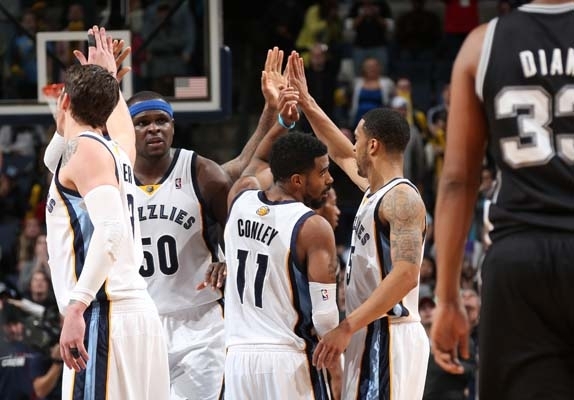 If you are a Memphis Grizzlies fan, last night’s game was encouraging, heartbreaking, but encouraging. If you are a San Antonio Spurs fan, not so much. The Southwest Division leaders almost let the last place Grizzlies come from behind and defeat them, almost. San Antonio led the entire game. With five minutes left, the Spurs were ahead by 16 points. At the buzzer, Memphis tied the game sending it into overtime. With 1.8 seconds left in OT, Ginobili drove a layup putting the Spurs up 110-108. Unfortunately for the Grizzlies, that is how the game ended. Mike Conley’s game-high 30 points did not include his three-pointer at the buzzer in Overtime – unfortunately it fell short. James Johnson had a season-high 15 points off the bench last night. In his debut in Memphis, Courtney Lee scored 12 points. (This was Lee’s first game as a Grizzlie after he was traded from the Celtics for Jerryd Bayless). Being double-teamed all night, Zach Randolph scored 17 points with eight rebounds. This was the San Antonio’s seventh straight win against Memphis. The Grizzlies dropped to 0-9 against Southwest Division opponents. Memphis’ loss in the final seconds of Overtime after a 16 point deficit was heartbreaking, but encouraging. It showed the Grizzlies never give up, displaying that ‘Grit n Grind’ even though the ‘Grindfather’ Tony Allen is benched with a hand injury. The Grizzlies take on the Suns Friday in Memphis.